The NFL Competition Committee, headed by Atlanta Falcons president Rich McKay and totally coincidentally including New Orleans head coach Sean Payton, recommended an expansion of replay review today, addressing among other things exactly the circumstance that recently screwed the Saints and sent the New Orleans area into a months-long hysteria. Each year the committee makes a series of proposals for changes to the rules of the game and how it’s officiated. Items 6 and 6a on the 2019 proposals, issued Thursday evening, propose expanding reviewable plays to include all fouls for pass interference, all roughing the passer penalties, and all penalties for unnecessary hits on defenseless players, for a one-year trial period. The proposals would also expand automatic reviews to include all scoring plays, turnovers, and PAT and two-point attempts that were negated by penalties. And, and, Washington and Kansas City recommended that personal fouls be subject to coach’s challenges. By my count, if these proposals are adopted ahead of next season, the only parts of an NFL football game that will not be subject to official slow-motion replay review will be concessions purchases. 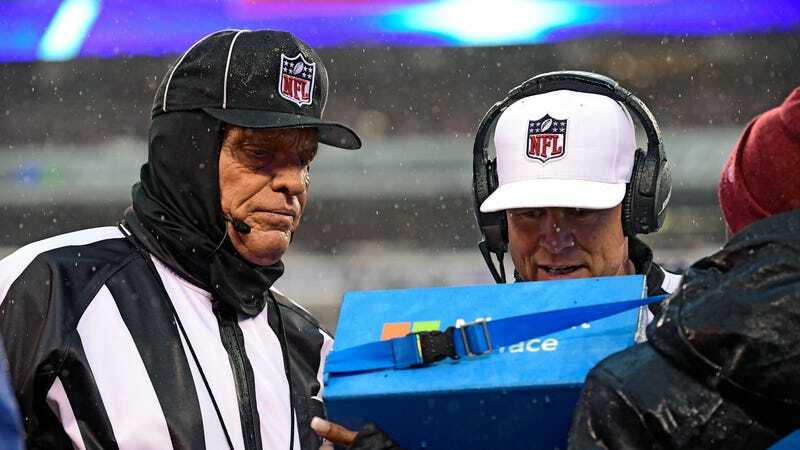 The eventual permanent expansion of review to include pass interference seems inevitable given the enduring controversy surrounding the glaring non-call that marred the NFC Championship back in January. Replay has been a part of NFL football since the 1999 season; NFL fans have mostly adopted the idea that what is seen in zoomed-in, super slow motion is true and correct, and that the integrity of a football game should therefore be judged according to that standard. It can seem arbitrary, then, when this or that kind of play is exempt from that level of scrutiny, and especially when, as in the case of that Saints-Rams non-call, those non-reviewable plays can be just as consequential to the finish of a do-or-die game. If the results of all plays can determine the outcome of a game, why aren’t all plays reviewable? The obvious answer is that replay reviews take time, and break up the flow of the game, and for that reason they are poor entertainment. Expansion of review has as its premise the idea that a perfectly officiated game is definitionally superior to an imperfect one, but that’s a hell of an assumption, before we even get to the part where in order to perfectly officiate a game you have to subject it to stoppages and delays and the occasional overturning of some of its most spectacular athletic feats. If the Competition Committee has its way, breakups and sacks will be added to the list of highlight plays subject to replay review. Getting those correct according to the rules is an attainable goal, so long as you are willing to endure a sport where more and more of what happens at the breathtaking speeds that make it worth watching is just a precursor to a slow-motion documentary being nitpicked by part-time officials on a damn tablet.